A brittle star fossil from Western Australia has revealed the starfishes lived 275 million years ago. 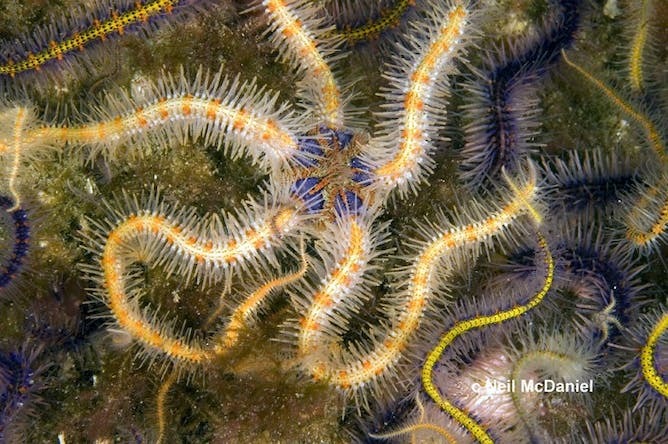 STRANGELY ELEGANT and beautiful, brittle stars are a group of starfish-like sea creatures. They exist in every colour under the sun, and some even shine with bioluminescence in the dark. The oceans of the world today teem with about 2,100 species of brittle stars (scientific name “ophiuroids”), mostly living in deep water. But they are an ancient creature, too. We recently published our report on a new genus and species of brittle star. Known as Teleosaster creasyi, it represents the first brittle star described from the fossil record in Western Australia, and lived 275 million years ago. The evolution of brittle stars / The Conversation. The five brittle stars that formed this discovery look like they are dancing across the siltstone block on which they are fossilised, two even arm-in-arm. This giant among brittle stars (approximate diameter of 15 cm) is more than 10 times the size of any known contemporary brittle star, and is an evolutionary hangover. It is the last known complete “archaic” brittle star, sharing a basic morphology and life habits with forms that first evolved in the early Ordovician time period (about 475 million years ago). It lived in Early Permian (Kungurian) time, about 25 million years before a great mass extinction event that marked the end of the Palaeozoic Era. This was a crucial time in Earth history, when all the major groups of marine animals evolved and some colonised the land. Our discovery is intriguing as it shows that these more ancient forms lived at the same time as today’s “modern” type of brittle star that evolved about 360 million years ago. These fossil brittle stars are also fascinating because they throw light on one of the major driving forces in evolution – predation pressure. Go back 275 million years, when Australia lay far to the south of its present position. The seas then were cold, as the Earth had only just emerged from a great ice age. Wild storms surged in from the west, and off the coast of what is now Western Australia, marine animals lived a tenuous existence. Still, the sea teemed with life and supported vast meadows. But these were not grass meadows, nor even seagrass meadows. They were echinoderm meadows. Echinoderms are a group of “spiny skin” sea creatures. Plant-like stalked crinoids (sea lilies) were dominant, with stems that anchored them firmly into the silty sand. With massive cups perched on the stems, and sinuous arms catching plankton from the water, they look for all the world like bizarre, warty tulips. Crawling between them were chunky starfish as big as dinner plates. The only delicate animals were the brittle stars, slinking across the silt on five tentacle-like arms that emerged from a central shroud-like disc. Today the wild seas of these ancient times have long gone, but the beds of silt that they churned up and redeposited now outcrop as rock in the bed of the river at Gascoyne Junction, east of Carnarvon in Western Australia. Known as the Cundlego Formation, these siltstones are one of the most spectacular examples of echinoderm meadows known anywhere in the fossil record. The fossils represent a “life assemblage”; in other words, the community was frozen in time in the very spot in which they lived, suffocated by sand and silt during a violent storm. Our research has shown that these newly identified brittle stars persisted in high latitude seas, whereas the “modern” types occupied warmer low latitudes seas. What drove the “archaic” forms away from the low latitude seas? In our opinion it was due to predation pressure. It has generally been thought that echinoderms, like many other groups of organisms, underwent major evolutionary changes after “the great dying” (as the Permo-Triassic mass extinction 250 million years ago is sometimes called). The brittle stars, though, seem to have bucked this trend by evolving into the modern guise much earlier. These forms evolved an arm morphology that was much more flexible than that in the older forms. They could probably move faster, scuttling across the sea floor on their more mobile arms, and also developed the ability to burrow in the sand and silt. The reason for the evolution of these traits was due, in our opinion, to the rise in shell crushing animals during Palaeozoic times, in particular condrichthyan fishes (the group including sharks and rays) and eumalacostracans (the group that includes crabs) in low latitudes. The brittle stars with their “modern”, agile body forms were able to withstand this predatory onslaught in low latitude seas, but the more lumbering ancient type was pushed into geographic regions seeking refuge where there were fewer of these predators, in this case into high latitudes. Interestingly, there is a modern analogue today in the seas around Antarctica. Here there are many echinoderm meadows, with the sea floor teeming with slow-moving invertebrates, including countless brittle stars, sea urchins and starfish. Predation pressure from shell crushers is relatively low, although recent fears of the arrival of armies of king crabs, possibly linked to the warming of Antarctica, suggests that our hypothesis might be put to the test sooner than we would have liked. Many more of these ancient Permian echinoderm meadows remain to be studied in Western Australia. This will help us to better understand the modern persistence of this ancient ecosystem, and how we may help to preserve these starry meadows into the geological future.